Reflection DO WE STILL NEED A SHEPHERD? Although Psalm 23 was written about three thousand years ago it can still speak to our hearts. We take a fresh look at each line and what it means to us today. On my own I wander through life, trying different things to make me feel happy and fulfilled but when I put my trust in God He will provide everything that I need. He helps me to stop and look around at all the good things that he has given me, my friends, my family, my home and to appreciate all the blessings that I have received. 24/7 my senses are bombarded with information, music, adverts, video games, TV and films. I fill my life with distractions but I need to stop occasionally and remember that I am a child of God. I need the silence of prayer to turn back to my loving Father, who is waiting with His arms outstretched to welcome me back. We have so many choices to make in our lives, especially when we are young. How can I know that I am making the right decision? If I allow God to lead me then I can be confident that even if I mess things up and make the wrong decision then God will show me and lead me back to the right path. If I trust in God He will protect me and give me the strength to get through difficult times. Sometimes our problems can seem overwhelming but nothing is impossible for God. 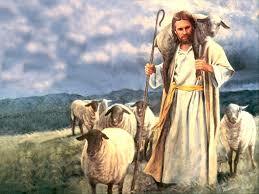 The shepherd uses his rod to beat off any wild animals and his staff to pull back the sheep who have wandered away from the flock. In the same way God will protect me when I am threatened or under attack and He will gently bring me back when I try to go the wrong way. Imagine that you are invited as guest of honour by your favourite football team, band, film star or celebrity to a banquet given in your honour. It is a magnificent party and you are seated on the top table with the other important people. All the other guests would know that there is something very special about you. This is how God feels about me, I am the guest of honour at His table. In God’s eyes I am like a king or a queen, whose head has been anointed with oil, and He will bless me until my cup of blessings overflow. There is no limit to His generosity. God is on my side and He loves me so much that there is no need for me to worry about tomorrow and what it will bring. God will always love me and He will continue to bless and protect me throughout my life and beyond. Praying Over Football- Right or Wrong?